You are here: Home / Reference / We Don’t Know How Lucky We Are! There are so many different types of bathrooms which you can buy for your home, modern and cheap or expensive and gorgeous. Many people are house proud however and like to have the best of everything or at least strive to. It makes you wonder what happened in the days when there was no specific room in the house that was ‘just’ a bathroom. Many years ago in the Victorian times poor people used to share one small room in a house, this small room was rented to the whole family and in the most cramped cities sometimes a couple of families. In their homes there were no modern features or comforts that we have in our homes today, the things that we take for granted. Often there was just a big fireplace/cooker which heated the whole room; these cookers were called a range. If people were lucky enough they would have use of the whole house and in every one of these rooms there would be a range to heat the room. The poor that could afford a little extra might have a tin bath, in every home the tin bath would be placed in front of the fireplace as this was the warmest spot in the room. Many families would bathe in the same water, one after the other and would top the water up for each person that bathed. Today this would be unheard of. Keeping up with household chores in the Victorian era would take hours upon hours of hard work, with no washing machines or vacuum cleaners, floor cleaning was done with a broom and then with a scrubbing brush on your hands and knees with perhaps only soapy water to wash the floor. In homes it is now the norm to have a toilet inside your house and even have a room dedicated to this one function, some people even have the luxury of a toilet upstairs and downstairs. In the Victorian times you would have one or two outside toilets for the entire street to share. If people were asked today to go share their toilet with their neighbours there would be outrage. There are many things in the family home that are taken for granted, running water on demand, central heating, carpet to keep the warmth in, fires, electric appliances… the list goes on. In the Victorian times there was no such thing as bathroom furniture, there was a tin bath, and a stool in front of the fire. Today bathrooms can consist of a sink, bath and shower, toilet and many different baskets and pots for all those personal little accessories we like to keep close to hand. 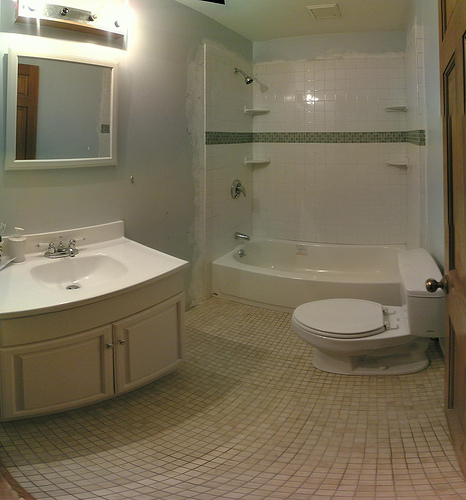 Bathrooms also often have cabinets, mirrors, bath mats and a plethora of other accessories besides.